"Use the process of TFT to reprocess negative emotions and be free of them for good!" Would you like to eliminate fears, anxieties, phobias and traumas without having talk about it? Would you like to quickly deal with emotional problems without having to go through years of therapy? Would you like to find out what foods or environmental toxins might be affecting you negatively? Would you like to overcome self-sabotage and deal with the most common reason for it? "Thought Field Therapy (TFT) is a new technique for the rapid elimination of all types of emotional distress. It works rather like acupuncture by stimulating the body's energy meridians. No needles are used — instead the client finger taps on various parts of the body. The results are amazing as emotional problems frequently disappear in minutes." Thought Field Therapy (TFT) is a highly specialised technique that brings almost instantaneous relief from all types of stress and anxiety. 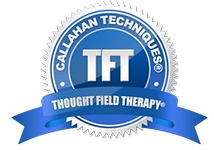 TFT was discovered and developed by Clinical Psychologist, Dr Roger Callahan. Whether it is freedom from negative emotions, self sabotage, or maximising your potential for personal development, TFT can be very effective at eliminating fears and anxieties. TFT is a cutting edge procedure that you can use to conquer emotional distress and many of life's concerns. It is a drug free method of literally tapping into the body's energy with information to allow healing – without using acupuncture needles, drugs or any other invasive means. TFT can provide emotional renewal quickly and safely with no side effects and without having to go through years of therapy. TFT offers dynamic results in a very short period of time and is incredibly effective in helping fears, phobias, anxiety, trauma, post traumatic stress disorder( PTSD), OCD, addictive urges, physical pain and many other problems that can be life-limiting, stifle happiness and personal performance, and act as barriers to happiness and health. TFT can be used to treat almost anything which might otherwise be treated with other therapies — anxiety, depression, phobias, addictions, pain, psychological trauma, grief, insomnia, jealousy, panic attacks and many other problems. TFT is also very effective in dealing with performance issues of all kinds: sport, business or personal.